I had to take a little break from the blog for another project. That project has been sent off, and there’s a lot swirling around upstairs. The last five months–wow–it’s hard to believe it’s been almost five months since Eve came home. So much has changed, and, yet, it’s hard to remember life before the six of us were together. Her dedication was this past Sunday and our friend Stephen said he had seen a picture of our family from February. He said it looked like there was a big hole in the picture, a gap where our Eve girl wasn’t there. At dinner last night, Peach asked Matt for a “campfire,” meaning fire in the fireplace. So, after bath times and pjs we all sat in front of the fireplace reading books. Lottie wanted to give Evie her bottle. (Yes, we still do one bottle a day for her because it’s a bonding moment, and we missed 20 months of those.) I looked over at them and thought of this time last year when our first court date was coming up in December. We walked through so much this year. But the gifts throughout this hard year have been beautiful and plentiful. 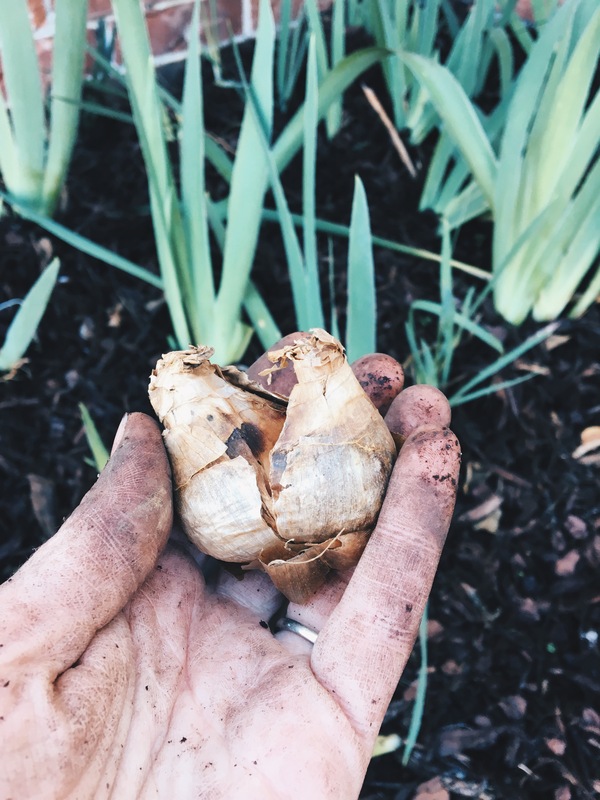 Saturday, I planted nearly 200 bulbs in our front yard. The big girls helped me while the little girls played in the dirt. The blade of the shovel cut through the dirt and I tucked in bulb after bulb, each one hidden beneath several inches of dirt to protect it through winter. There is nothing to show for my work right now, except a bit of a bruise on my right palm from all that digging. But I’m believing that come spring tulips and narcissus and later in the summer anemones and ranunculus will bloom. Somewhere around bulb #89 the obvious metaphor hit me. This is what growth looks like. There’s digging, and it’s dirty. There’s planting, and it feels hidden. There’s growth, and it feels slow. But wait. Because the beauty is there already. And in time it will bloom into something that reflects the glory of its Creator. Sweet Elissa, I have missed your wise words, but I have loved seeing pictures of the Roberts family of SIX!